Agrammatism provides an overview of the state of knowledge on agrammatism, typically defined as a disorder of sentence production involving the selective omission of function words and some grammatical endings on words. The book opens with discussions of the diversity of the disorder. This is followed by separate chapters that address primarily questions of syntactic structure in agrammatism, from both linguistic and psycholinguistic perspectives. Within these two gross sections there is no consensus among the conclusions reached by the various authors. However, the position is taken that agrammatism is a disorder distinct from other aphasie disorders of sentence structure. This position is reconsidered in the final two chapters. 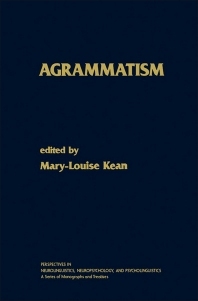 Because of the intrinsically interdisciplinary character of research on agrammatism, it is hoped that the work presented in this volume will be of interest to linguists and psycholinguists working in areas outside the domain of aphasia, as well as to neurolinguists and neuropsychologists who are already involved in the study of language deficits. 1 Is Agrammatism a Unitary Phenomenon?